A pergola or shade arbor is an excellent way to add a visual focal point to your garden and create a shady place to relax. Climbing plants help your pergola or arbor provide more shade and harmonize with the surroundings. Planting one or more of the seven climbing flowers below will add beautiful color to your pergola or arbor as they grow. There are hundreds of types of roses. 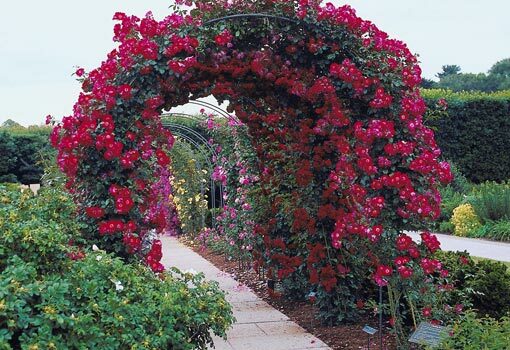 Some roses grow as bushes, and others are climbing roses that look beautiful on a pergola or arbor. 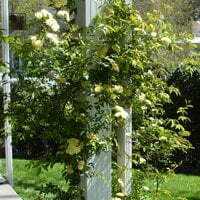 The Lady Banks rose is a lovely climbing rose with small white or yellow blossoms. Lady Banks roses are best for warmer areas—they’re hardy only to USDA Hardiness Zone 7—so the Midwest wouldn’t be the best place to plant these roses. Laguna roses are another climbing rose with large, deep-pink blossoms. Laguna roses are hardy to USDA Hardiness Zone 5, so they thrive as far north as New York or parts of Ohio. Remember that roses require training to grow on a pergola or arbor, unlike vines such as morning glories, which will just climb on their own. Wisteria is a fast-growing flowering vine that produces beautiful, garland-like strands of purple, lavender, or white flowers. Wisteria creates an especially dramatic effect on structures with horizontal surfaces that the flowers can dangle down off of, so a pergola or arbor will give you the chance to really appreciate wisteria’s beauty. One issue with wisteria is that many plants are imported and considered invasive species because they grow so quickly and get so large. Chinese wisteria (Wisteria sinensis) and Japanese wisteria (Wisteria floribunda), although very beautiful, can sometimes escape into forests and choke out native plant life. 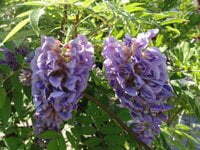 Wisteria also requires diligent pruning to prevent it from quickly taking over your garden. However, there is another wisteria option available. Wisteria frutescens is native to eastern North America, and it’s just as beautiful as its imported cousins. This native plant is non-invasive and more cold-tolerant than the imports, but you will still have to be diligent with your pruning shears. This flower looks stunning on shade arbors! Morning glories (Ipomoea purpurea) are a fast-growing vine that produces trumpet-shaped flowers. Their blooms come in a wide variety of colors—including vivid blue as well as multi-color combinations. Morning glories are very low-maintenance, just plant seeds, and they will grow up onto your arbor or pergola on their own. Morning glories are considered annuals, but will often self-seed and come back on their own for several years. In fact, their hardiness has become a liability in certain environments, causing states such as Arizona and Arkansas to ban them as invasive species. Because of this, be sure to check with your local garden center or university extension before ordering morning glory seeds online. 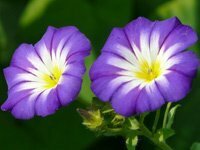 But in most areas, morning glories are a quick and easy way to beautify your arbor or pergola. 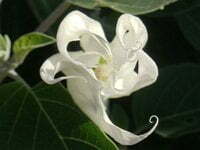 Moonflowers are close cousins to morning glories. All of the information in the section on morning glories also applies to moonflowers, except for two things. First, unlike morning glories, which bloom at dawn and stay open during the day, moonflowers bloom at dusk and stay open all night. Second, while morning glories are typically brightly-colored flowers, moonflowers are a gorgeous pure white that seems to glow in the moonlight. This makes moonflowers the ideal addition to a moon garden, and perfect for you if you like to enjoy your pergola or arbor after dusk. 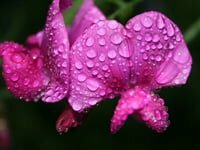 The sweet pea (Lathyrus odoratus) is an annual flowering vine that will delight two of your senses at once: its fragrance is so heavenly, it gave the sweet pea both its common name (“sweet”) and its botanical name (“odoratus”). Sweet peas also boast show-stopping fan-shaped blooms that look a bit like Phalaenopsis orchids. Sweet pea blooms can be pink, lavender, purple, white, red, or yellow. With sweet peas you can gaze upon their beauty, then close your eyes, take a deep breath, and enjoy their sweet scent! Most of us think of hydrangeas as those big pom-pom-like clusters of blooms that you usually see in flower pots or planted as a border. But there are several types of hydrangea, some of which look much different than the “classic” hydrangea. Hydrangea anomala is a climbing shrub with lavender or white “lacecap” type blooms. 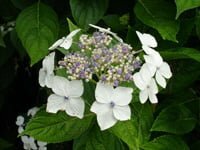 You can train these hydrangeas to climb your pergola or shade arbor, and their intricate blooms will be a real feast for the eye. Camellias have large, brightly-colored, rose-like blooms that are sure to grab the attention of anyone who enters your garden. Camellia japonica is the most common type of camellia, and this beautiful flower can have blooms that are pink, white, orange, lavender, red, or yellow. 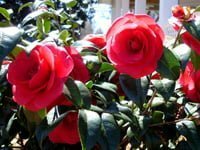 You can train a camellia shrub to grow against the side of a pergola or shade arbor espalier-style. Camellias are cold-intolerant plants that are hardy in USDA Hardiness Zones 7 through 9. Choose one of these beautiful flowering plants, and take your pergola or shade arbor to the next level!